Home » NEWS » Octopuses are smart, inventive creatures. Factory farming them would be a disaster. admin January 31, 2019 January 31, 2019 No Comments on Octopuses are smart, inventive creatures. Factory farming them would be a disaster. Researchers are looking into industrial production of octopus for food. It’s a terrible idea. But this hasn’t stopped the push to factory farm them. Teams from Spain to China to Chile are testing new methods of intensive octopus farming. A new study argues that the nascent factory farming of octopuses is a bad idea — a moral and ecological disaster waiting to happen. But there are no octopus factory farms yet — which means that, for once, we could stop a mistake before we make it instead of spending decades recovering from it afterward. Octopuses are not a part of a regular diet anywhere in the world, but they’re a delicacy in many countries. Some 350,000 metric tons of octopus are caught annually, and the real numbers may be higher, as fishing is often underreported. To some, this looks like a business opportunity; octopus could be sold more widely and become a bigger part of the food supply. Researchers are working to figure out how to keep octopuses alive in tiny, featureless cages for long enough to harvest them for food. But “there’s almost zero chance that this represents acceptable welfare to any standard,” Jennifer Jacquet, one of the co-authors of the report, told me. Factory farming octopus is terrible for the environment, too: “On land, we farm herbivores. In the ocean, we tend to farm animals that are carnivorous, and we have to put more pressure on the oceans,” to catch all of the animals we need to feed to the animals we’re raising for food. “We think that aquaculture will alleviate pressure on wild ecosystems, but it actually exacerbates that pressure,” Jacquet said. Nonetheless, the group’s report, published in the winter 2019 edition of Issues of Science and Technology, finds that efforts to industrially farm octopus are plunging ahead. In China, up to eight different species of octopus are now being experimentally farmed. In Japan, the seafood company Nissui reported hatching octopus eggs in captivity in 2017 and is predicting a fully farmed market-ready octopus by 2020. 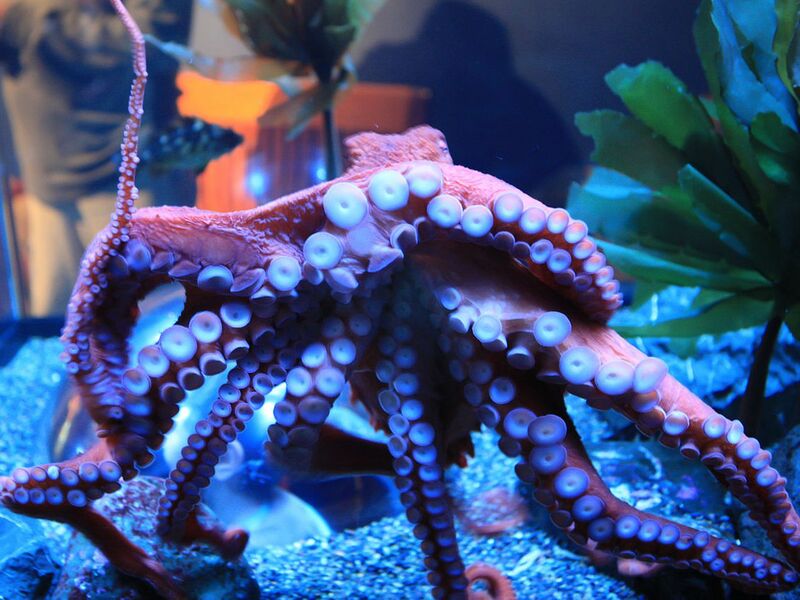 Many scientists are contributing to the tools and technology to make genetic modifications that may accelerate industrial aquaculture of octopus and other types of cephalopods. Spain, Portugal, Greece, Mexico, and Chile have active octopus farming efforts underway as well. The researchers urge their colleagues working on inventing techniques for industrial farming of octopus to reconsider. There are three key reasons why. Global fisheries are already being depleted by overfishing. Aquaculture, sometimes sold as a solution, often makes this worse by dramatically increasing the demand for fish products. “The over-fishing of the oceans to get food for farmed fish is already a big problem, and this would be made worse if octopus farming became common,” Peter Godfrey-Smith, co-author of the paper, told me in an email. I asked Jacquet whether it’d at least be good for wild octopus if more octopuses for human consumption came from farms. It likely wouldn’t, she said. As long as it’s cost-effective to catch octopus in the wild, we’ll keep doing it — and aquaculture might actually increase demand, by making octopus cuisine more mainstream. Third, the usual justifications for intensive animal farming don’t hold up in this case. “The case in favor of octopus farming is weak,” the paper points out. “The main markets for farmed octopus — upscale outlets in Japan, South Korea, northern Mediterranean countries, the United States, China, and Australia — are largely food secure” — meaning that the populations in those countries have affordable, consistent access to food that meets both their needs and their preferences. Industrial farming of animals is hard to tackle because many food-insecure populations rely on meat. No one is relying on octopus. It’s a bad idea to change that. What can be done? The Issues in Science and Technology article, written by Jacquet, Godfrey-Smith, Becca Franks, and Walter Sánchez-Suárez, is aimed at the research community, and urges it to target forms of agricultural research that alleviate food insecurity or make food production cheaper, rather than adding strain to the food system and introducing new inhumane practices. We could also make progress, Jacquet told me, by introducing legislation to ban the sale of farmed octopus in major US cities. It may seem silly to ban something that doesn’t yet exist, but the bans could send a strong statement that there won’t be demand for the product, persuading the teams investing in octopus farming research to put their time and energy somewhere better.